Transformation: introduction of recombinant DNA into an organism. The earlier available techniques (biolistic, electroporation, lithium-acetate or CaCl2/PEG techniques) for transformation of fungi require protoplasts or particle guns. Good protoplasts can be difficult to produce consistently due to variations in enzyme batches (Ruiz-Die 2002). In 1998 de Groot et al. (de Groot et al. 1998), successfully applied Agrobacterium tumefaciens mediated transformation (also known as ATMT) to Aspergillus awamori, A. niger, Fusarium venenatum, Trichoderma reesei, Colletotrichum gloeosporioides, Neurospora crassa and the technique has later been applied to F. oxysporum by Mullins et al. (2001). The technique had up till then only been applied to dicot plants (since 1981 (Matzke & Chilton 1981)) and monocot plants (since 1993 (Chan et al. 1993)). The advantages is that transformation can be carried out on conidia, spores or even vegetative cells (Dobinson et al. 2004) (Mullins & Kang 2001). The technique showed a 600 fold increase in transformation efficiency for A. awamori compared to protoplast-based techniques, and the majority of transformants only harbors a single copy integration (de Groot et al. 1998) (Dobinson & Kang 2001). The gram-negative genus Agrobacterium comprises of both soil born saprophytic and parasitic species. Many of the parasitic species cause neoplastic diseases in plants, among others “hairy root disease” (A. rhizogenes), “cane gall disease” (A. rubi), “crown gall of grape” (A. vitis) and “crown gall disease/ crown gall tumors” (A. tumefaciens) (Escobar & Dandekar 2003). They all use horizontal interkindom gene transfer as a means to make the host plant provide suitable conditions for survival of the bacteria. The genes located on the transferred DNA (termed T-DNA) can be divided into two groups: The oncogenes, whose products (ultimately auxin and cytokinin) cause the plant cells to proliferate, resulting in the formation of the typical gall phenotype. And the genes encoding opine like compounds, which can be metabolized specifically by the infecting Agrobacterium, but not by the plant itself. In this way, the bacteria induces the plant cells to produce energy and nitrogen for the bacteria (the opine compound). The T-DNA is located on a large Tumor inducing (Ti) plasmid (> 100 kb (Tkacz et al. 2000)) which contains two additional classes of genes; Vir and Opine catabolism. Vir genes encodes the proteins needed for formation of T-DNA, T-pilus and transport of the T-DNA to the host cell nucleus (Michielse et al. 2004). While the Opine catabolism genes encodes the enzymes needed for the utilization of the opine compound released by the plant host following successful transformation. The boundaries of the T-DNA region is defined by two imperfect repeats (25 bp long) called right and left border, RB and LB respectively (Figure 1). Figure 1: Structure of Ti-plasmid. The T-DNA stretches from RB to LB, including Oncogenes and Opine synthesis genes. Agrobacterium typically infect wounded plants. The release of plant saps, containing amino acids, sugars and organic acids, attracts the bacteria to the wound by positive chemotaxi. Once the bacteria reach the wound, it attaches itself to the plant surface by synthesizing cellulose fibers (Escobar & Dandekar 2003). In addition to the mentioned metabolites wounded plants also produce a wide range of phenolic compounds, such as coniferyl alcohol and acetosyringone (AS) (Tkacz et al. 2000). These compounds induce the bacteria to generate T-DNA, by a two component signaling system (VirA/VirG). Acetosyringone activates VirA, a membrane bond receptor, which activates the VirG (transcription factor). The activated VirG can then interact with activator elements found in the promoters of the virA, virB, virC, virD, virE and virG operons, resulting in elevation of their expression levels (Figure A.3). VirC and VirD (both nicking endonucleases) binds to the RB/overdrive sequence and cuts the ssT-DNA region out of the Ti plasmid. VirE2 binds to the ssT-DNA, protecting it from degeneration by nucleases and self-annealing. VirB2-B11 forms a T-pilus through which the VirE2 coated ssT-DNA is transferred from the bacteria into the targeted plant cell (Zupan et al. 2003). The exact mechanism of this process is not yet fully understood. Inside the host cell, a C-terminal located NLS in VirE2 directs the DNA into the nucleus, where host factors are believed to facilitate its integration into the genome, possibly mediated by the DNA repair system (Michielse et al 2004). If no great sequence similarity exists between the plant genome and the introduced T-DNA, the T-DNA integrates randomly into the nuclear genome of the plant (Mullins et al. 2001). It was quickly realized that any genetic material placed between the cis-acting RB and LB sequences would be introduced into the genome of the targeted plant cells, offering an easy way of producing transgenetic individuals (Matzke & Chilton 1981). However, the large size of the Ti-plasmid (> 100 kb) initially made it very difficult to handle and manipulate by standard techniques. The solution was to move the T-DNA region onto a smaller shuttle vector (Figure A.4). This is possible as the Vir genes (still located on the originate Ti-plasmid) are trans-acting. Vector systems of this type are called “binary vector systems”. These are also disarmed as both the oncogenes and opine synthesis genes found in the wt T-DNA has been replaced by selection marker genes (antibiotic resistance), resulting in asymptomous infection. 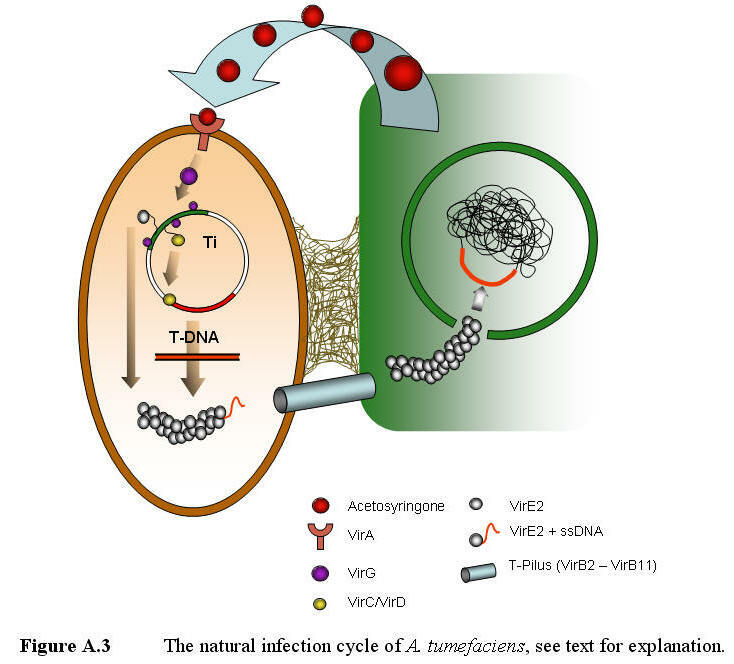 The opine catabolism genes on the Ti-plasmid has also been removed, leaving only the Vir genes necessary for the transformation machinery and structures that ensures stable replication of the plasmid in A. tumefaciens (Hellens et al. 2000). Many different T-DNA bearing plasmids have been designed, but generally, three functional types can be recognized (1) random mutagenesis, (2) promoter trapping and gene tagging and (3) deletion of specific genes (Hellens et al. 2000). Figure A.4 Binary vector system, characterised by the splitting of the Ti-plasmid into two (Ti-plasmid and T-DNA vector). The size of the three DNA pieces is not drawn to scale. The T-DNA normally integrates randomly into the genome of the targeted cell. However if large segments of the introduced DNA show a high degree of similarity to parts of the target genome, this will “overwrite” the random integration, resulting in homologous recombination. The length required for efficient homologous recombination varies from specie to specie, but in general the success rate is raised with increasing length of the segments showing similarity (Dobinson et al. 2004). Mullins E.D. and Kang S. “Transformation: a tool for studying fungal pathogens of plants”, Cellular and Molecular Life Sciences (2001), Vol. 58, p. 2043-3052.